Make sure his visitors feel welcome. If children fit on your timeline in the future or you have a pack of nieces and nephews who visit regularly, finding a dog willing to overlook the extra commotion that comes with kids is important. Many breeds fill the bill. The hardest part may be picking just one dog. Medium breeds are those weighing about 35 to 65 pounds and standing from 13 to 24 inches tall at the shoulder when fully grown. Many dogs fall in the range, according to American Kennel Club standards, and nearly as many generally go well with children. Narrowing the focus is often a matter of considering which breed's activity level or grooming needs make a good match for you. Size may also determine your pick -- there is a big difference between 35 pounds and 65 pounds of dog roaming around your home. At 13 to 15 inches tall, the beagle of Charlie Brown fame is a sturdy, short-haired breed that grooms easily. He typically has a gentle and lively personality that keeps pace with even the most active children. Another who is small in stature but stout in build is the bulldog, or English bulldog. He has some problems with overheating because of that short nose, which can limit his activity a bit, but his devotion to children lasts all day. The AKC notes the bull terrier is another good match with kids but recommends supervision when around smaller children due to his love of rambunctious play. He needs daily activity to siphon off all that energy, has an easy coat to maintain and excels in obedience training. The golden retriever's size puts him at the top of the medium ranking. That abundant double coat requires regular brushing, but he's highly trainable and his built-in people-loving nature makes him an excellent companion for kids. Boxers are a great alternative if you want a larger medium dog with a sleek coat that sheds just a touch. Well-muscled, playful and intelligent, a typical boxer craves quality time with his family and is known for adoring and protecting children. Standard poodles are an old-time favorite that have the patience and intelligence to share their space with kids. He won't shed like other breeds but requires regular haircuts to keep those locks tamed. 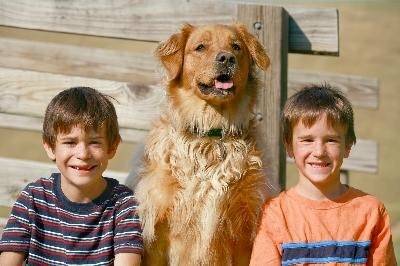 While the list of breeds that get along with children is long, your dog needs to be around kids in order to get used to them. If you don't plan on having children for a few years or kids are once-a-month visitors to your home, be sure to socialize your dog with regular trips to busy parks or by trying out other activities, like agility trials, that bring him in contact with crowds of people and other dogs. When the kids do visit, make sure they understand how to interact with your four-legged friend by running through the ground rules -- including just how much of that peanut butter and jelly is for sharing. Are Peace Lilies Dangerous to Dogs? "The Best Dog Breed for Calmness, Children & Other Animals"